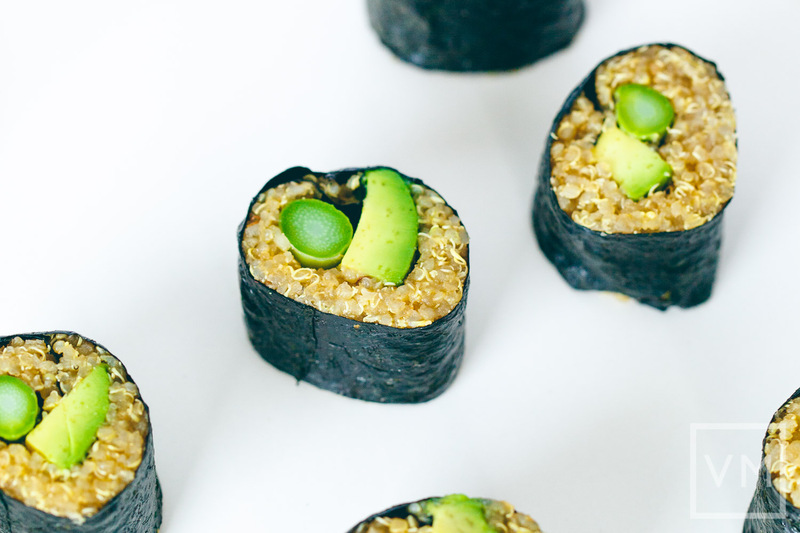 The combination of asparagus and avocado provide the crunch and cream to this roll while the quinoa holds up remarkably well inside the nori without falling apart like you might expect. This recipe made 5 sushi rolls, enough for 3-4 people. These were great leftover and since they held up so well in the fridge I could really see these being perfect for a packed lunch. 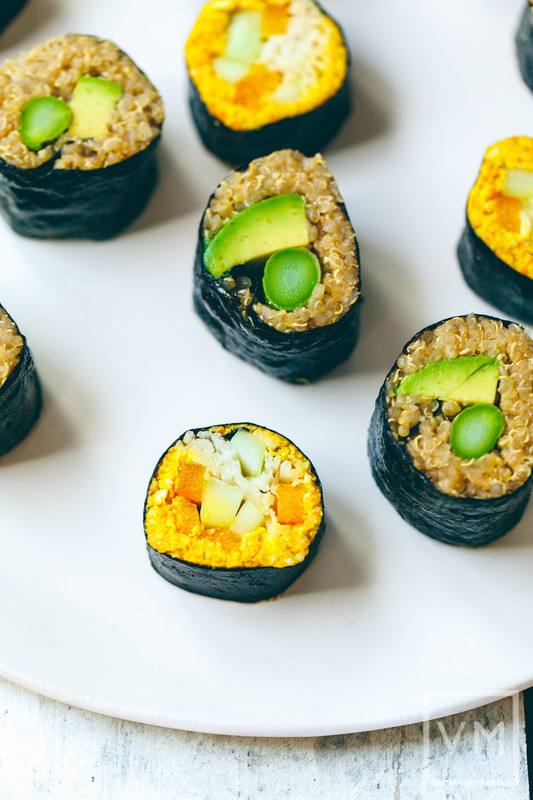 In fact, I was surprised that these quinoa sushi rolls were even better than typical sushi leftover – whereas leftover sushi rice tends to get hard and dry in the fridge overnight, the quinoa sushi remained moist without getting soggy. 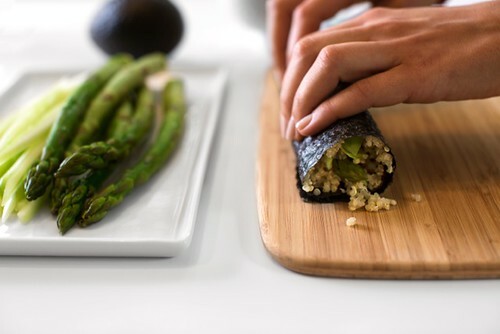 We enjoyed this Gena’s Asparagus Quinoa Sushi Rolls so much that we made it a second time with the addition of shiitake mushrooms and sweet soy sauce, miam miam! Mix the quinoa, rice vinegar, sesame oil, tamari, and mirin (or sweetener) together in a mixing bowl. 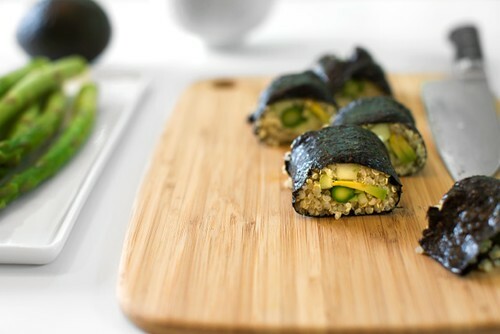 Lay a sheet of nori, shiny side down, on a flat, dry surface in front of you. The shorter end of the sheet should be facing you. Spread ¾ cup of quinoa over the sheet, starting at the bottom. Allow ⅓ of the wrapper to remain bare (the third that is farthest away from you, at the top). 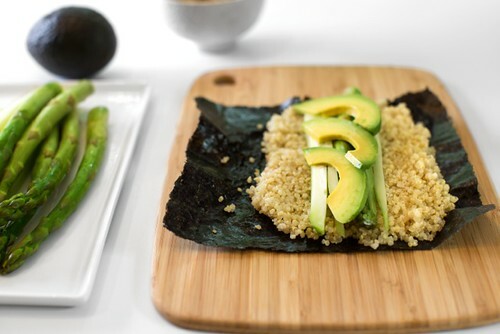 Lay an asparagus spear horizontally across the quinoa, about 2 inches from the bottom of the sheet. Top it with a few slices of avocado. Starting from the bottom, gently roll the nori up, applying pressure as you go. When you get to the top, moisten the top edge of the nori roll; this will help the roll stick together. Use a very sharp knife to slice the roll into pieces (about five). Repeat with the three remaining nori sheets. Serve with tamari for dipping, or any dressing you like. 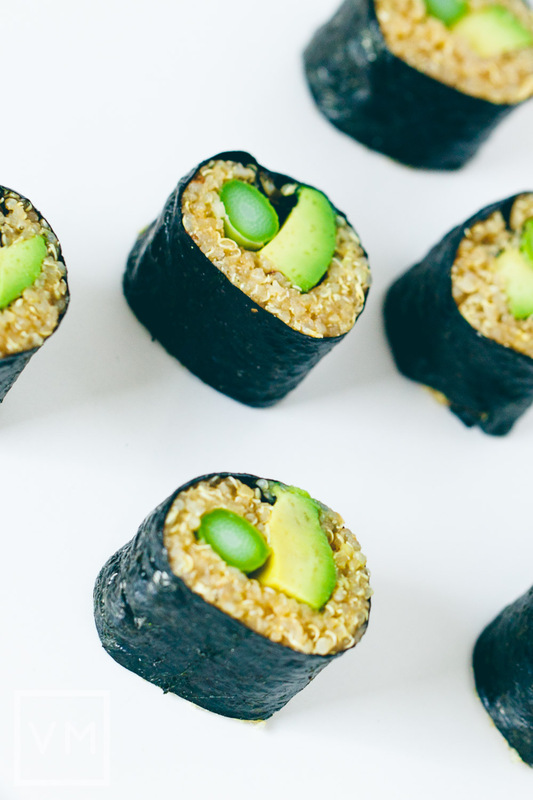 You can prepare the quinoa as instructed, and store it for up to 3 days in the fridge, rolling the sushi as desired. 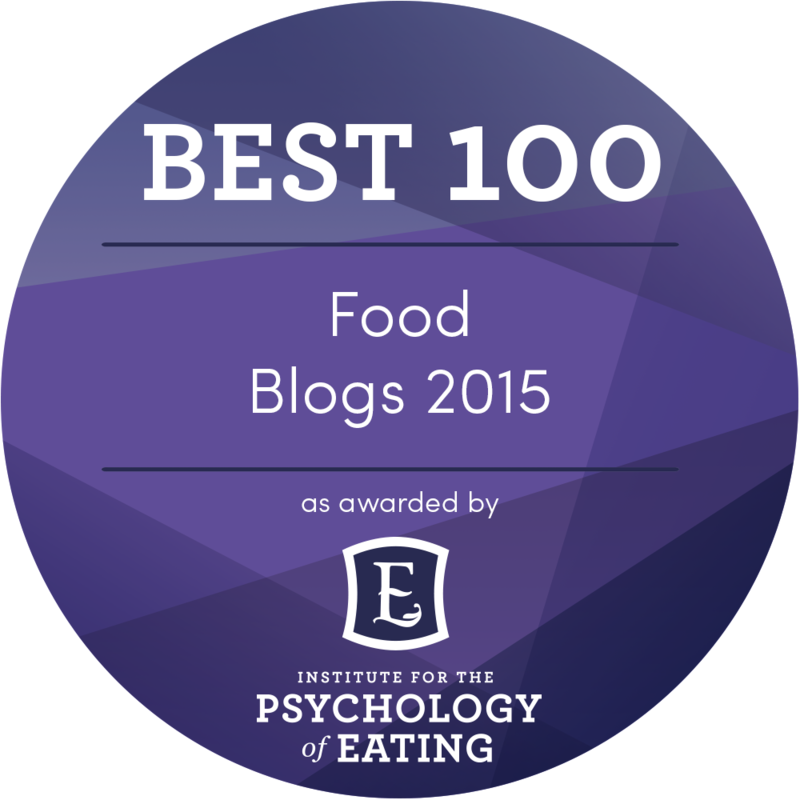 From Choosing Raw: Making Raw Foods Part of the Way You Eat by Gena Hamshaw. Reprinted with permission from Da Capo Lifelong, © 2014. Step-by-Step photos in the recipe are taken by Hannah Kaminsky.